Sixers’ center Joel Embiid shoots against the Portland Trail Blazers during the second half of an NBA basketball game in Portland, Ore., Thursday, Dec. 28, 2017. 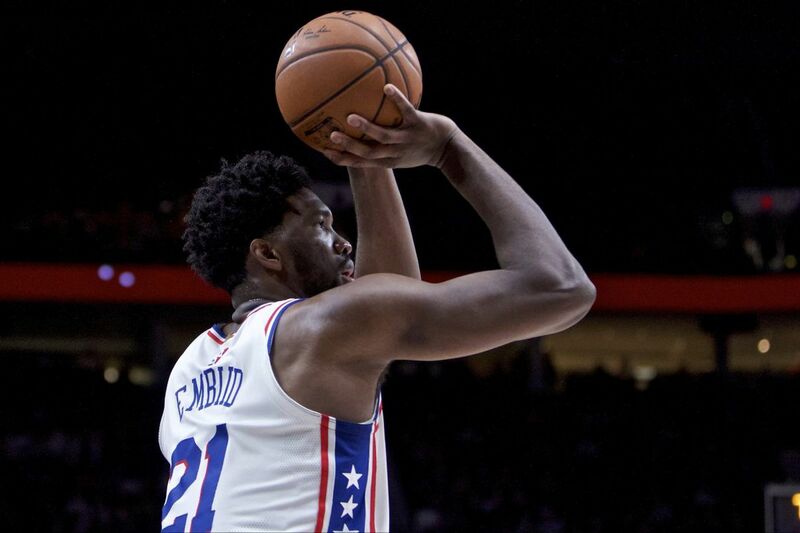 Joel Embiid will play Wednesday night's game against the San Antonio Spurs despite a sprained right hand. The 76ers center suffered a sprained right hand in Sunday's victory over the Phoenix Suns at Talking Stick Resort Arena. He was ruled out about 45 minutes before tip-off, but felt good during warm-ups and said he would be good to play. This injury occurred when he crashed hard to court with 3 minutes, 54 seconds remaining after colliding with Devin Booker near midcourt while leaping after the ball. The center landed on his back, hurting his right hand. Embiid grabbed his hand and grimaced in pain. He remained in the game, but kept shaking and rubbing the hand. After the game, Embiid had X-rays, which were negative. Embiid said his hand was numb the remainder of the game. He didn't attempt a shot following the accident. However, he went on to grab three rebounds and block a shot before leaving the game with 41 seconds left. The Spurs will be without Rudy Gay (right heel), Tony Parker (return from injury management), Kawhi Leonard ( return from injury management), Manu Ginobili (rest) and Danny Green (left groin tightness).